Foundations of Science, a set of tools that will use machine learning and artificial intelligence to provide personalized support for students in college-level science courses, has taken the top prize in New York University's inaugural Algorithm for Change competition. 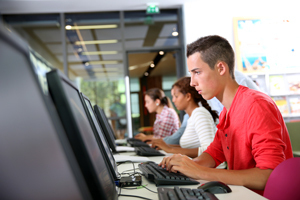 The courseware was created by Smart Sparrow in partnership with ACTNext (a multi-disciplinary innovation unit of nonprofit and college readiness exam provider ACT) and Arizona State University's Center for Education Through Exploration. The competition, administered by NYU's Center for Social Entrepreneurship, was designed to identify artificial intelligence, machine learning and augmented reality solutions to "help low-income, under-represented minority and first-generation students get to and through college," according to a news announcement. Out of a group of 70 submissions, nine finalists pitched their ideas before a panel of judges at NYU. The Smart Sparrow team received a $500,000 cash prize as well as coaching and mentorship to further develop Foundations of Science. The courseware will teach introductory science through narratives and case studies, combined with machine learning and AI tools that "detect when students are struggling with foundation concepts or skills and recommend just-in-time interventions," the announcement said. "We're honored to have won the competition. Using Smart Sparrow's learning design platform, instructors and designers have already seen great success improving student outcomes in science courses," said Jacqui Hayes, director of studio innovation at Smart Sparrow, in a statement. "We believe that we can go further still, powering additional scaffolding and adaptivity through machine learning and artificial intelligence." "Smart courses, which adapt in response to student behavior and provide instructors with valuable, real-time insights on skill gaps and engagement drop-offs, have an incredible potential to help more student graduate faster," commented Saad M. Khan, director of AI and machine learning at ACTNext. "Foundations of Science is designed to leverage AI and machine learning to help more at-risk learners successfully complete their academic journeys."